Long ago, there were no factories. If you wanted food, you grew it yourself or bought it from a nearby farmer. If you wanted clothing, you made them yourself. You might have even made the cloth from wool sheared from your own sheep. Until recently, people made much of what they needed with their own hands. Other items were bought from craftspeople living in the area. Things took a lot of time and work to make and cost a lot of money. Factories changed all that. In a factory, workers gather together to make products. Each person has a specific job so products can be made quickly. For example, in a clothing factory, one person cuts out the fabric, another person sews the garment, while another person adds buttons and finishing touches. Factories have made our lives easier in many ways. They’ve also made some things harder. 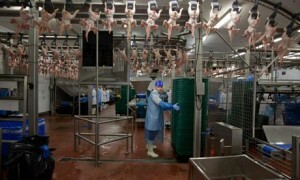 All About Factories: This is a meat packaging factory. The first factories were ship-building factories in Venice, Italy. At one time, these factories could produce one ship every day. The factories ran from about 1200 to Napoleon’s conquest. Matthew Boulton opened one of the first factories in Birmingham, England. Here, his factory made money, silverware and metal work. Henry Ford developed assembly line factories. Workers stood alongside moving ramps. Each worker had specific parts for building cars. The workers could build good cars quickly and inexpensively. Today’s factories still use assembly lines. Before factories were developed, people usually had just the things they needed. Today, people like to shop and can buy almost anything they want, whether they really need it or not. Most of the food we eat is made in factories. Some of this food is healthy; some is not so healthy. 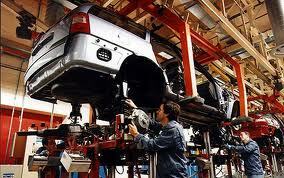 This is a car making factory. One hundred and fifty years ago, children were often forced to work in factories in the United States and England. A video about the Toyota Factory in Mississippi. Question: Who works in factories? Answer: Today, many factories and industries in the U.S. have closed because factories in Asia can produce goods more cheaply. One hundred and fifty years ago, children were often forced to work in factories in the United States and England. They worked very hard and were often treated cruelly. Both the U.S. and Europe made laws against child labor. Today, some children in Asia work in factories. Enjoyed the Easy Science for Kids Website all about Factories info? Take the FREE & fun all about Factories quiz and download FREE Factories worksheet for kids. For lengthy info click here. Declan, Tobin. " All About Factories: History and Importance - ." Easy Science for Kids, Apr 2019. Web. 21 Apr 2019. < https://easyscienceforkids.com/all-about-factories/ >.